See Footnote 1 for more of the Twitter thread discussing this analogy. I suggested in that Twitter thread that America may need to buy nuclear from someone who can build it cost competitively (South Korea). There are only two companies on the planet that build the vast majority of large airliners. Why can't the same be true for nuclear power stations? I used airliners for an analogy because I work in the industry, but I could have used any number of other industries, like ship building, which South Korea has also been dominating for some time. For many good reasons, Shellenberger didn't embrace the idea that the West might just have to cede the design and construction of nuclear power stations to China and South Korea like we have for things like ship building and steel making. Two companies dominate production of large-bodied jet planes: Boeing and Airbus. Note that the Koreans, Chinese, and Russians represent the opposite of the West ...the East. The Airbus of nuclear should be run by someone with significant experience in nuclear plant construction — since that's where the cost savings (and overruns) come from — not engineering. Note that Toshiba, Mitsubishi, and Hitachi, are Japanese companies, who are in the East. So, it really isn't about an East-West divide after all. China and Korea are happy buying Boeing and Airbus jets. Why can't we buy their nuclear like we buy their ships, solar panels, and just about everything else? Also, engineering does not run companies, so there's little concern in that regard. The engineering arm of a company gets its direction from corporate leadership, not the other way around. The blame for cost overruns belongs to management (and regulators who change design requirements midstream), not engineering. The UK should scrap all existing plans and start from a blank piece of paper. All new UK nuclear plants should be of the same design. He's got a point. A good example to follow would be Canada and their 19 CANDU reactors (which are also in use in six other countries). I crossed out that part about operation. As is the case with any new airplane, operation and maintenance learning curves tend to be fairly short. Pilots and maintenance personnel are experts within about a year of a new model arrival. If I were king, I'd pick the AP1000 (Advanced Passive) which would have prevented TMI, Chernobyl, and Fukushima and all of the attendant bad press and expense. Once a few of the AP1000s are built in series by the same entity, their costs to build will be little different than if you had stuck to an older design, likely less because they use far fewer parts. But only until you have enough experienced people to farm individuals out to other places to pass on their knowledge. To have an impact on climate change, many power stations would have to be built in parallel. And yet what makes nuclear plants safer and cheaper to build and operate is experience, not new designs. That sentence mixes up the words safer and cheaper, build and operate, experience and designs. I'd break them out into separate sentences. As he said elsewhere in the article, it's hard to make something that is so safe, much safer. But a reactor meltdown is not cheap. Worse yet, thanks to antinuclear groups and the sensationalist driven lay press, the three incidents of note over the last half century have been used by antinuclear groups to create a public relations problem. That's why I'd go with the AP 1000 or another passively safe design that minimizes the already minimal chance of a melted core, which Fukushima has shown is not dangerous, but still something to be avoided. Experience definitely makes them cheaper to build, but that is largely regardless of the design chosen. There are eight AP1000 reactors under construction, four in China and four in the United States. That means there are about four lead construction firms with experience building them. This is the makings of an international consortium similar to Airbus, which has partners that all speak a different language in France, Germany, Spain and the United Kingdom. Again, Shellenberger is placing too much emphasis on the importance of experience with regards to the operation of a nuclear power station. Unlike a construction firm which will move experienced people from project to project, each new station has to be staffed by new people. To them, it's irrelevant if the nuclear plant is a new design. They have to be trained to operate it, regardless. Translation; because nuclear power stations are already very safe, one would be hard pressed to prove a new design is even safer (the same could be said about airliners). So, it really isn't about safety. It's about the cost of a core melt, both financially and from a PR perspective. The new passively safe designs will make it nearly impossible to have a loss of coolant cause a shut-down core to melt from its own residual heat. It's a valuable design feature that should be part of any new power station. Again, I would quibble. The safety record of nuclear power is mostly a result of engineering design. Experience would not have prevented TMI or Fukushima, which were caused by mechanical design failures, not human operational error. Had they been AP1000 passive designs, their cores would have automatically and without need for any power or human input, been kept cool by a large water reservoir using natural convection for circulation. The Chernobyl reactor melt was caused by a combination of a terrible hybrid power and weapons production design and operator error (allowed by the design), however, if it had a containment structure like those at TMI or Fukushima, the results would have been far less costly both financially and image wise. The same is true of aircrafts (sic). What made air travel safe was many decades of training and experience by pilots, air traffic controllers, and regulators — not radically different jet plane designs. Analogies are always imperfect, or they wouldn't be analogies. The safe operation of an aircraft is vastly more dependent on the operators (pilots) than a nuclear power station is, largely because nuclear power stations don't fly. As I mentioned above, two of the three nuclear core melt incidents of note were caused by design errors, and the impacts of Chernobyl, although caused by operator error, would have been minimized by better design. In fact, new designs risk depriving managers and workers the experience they need to operate plants more safely, just as it deprives construction companies the experience they need to build plants more rapidly. And again, the impact of new designs on operational learning curves is not an important factor for new nuclear designs (or new airliner designs). That's four different nuclear power station designs. My hypothesis; this is what can happen when you let politicians design your electrical grid. Look to Germany for another example of this. Note in the above graphic how radically different each power station is from the other. They have three different containment structure designs as well as three different cooling tower designs, and probably different everything else on the inside as well …unbelievable. The French and Canadians used one design which they repeated over and over again. The cost to build the first 777 airliner was astronomical. Imagine the expense of building a different airliner from the ground up for every customer. Consumers of course had to pay for this boondoggle, but even so, thanks to our hydro, we still have some of the lowest rates in the country. The fact that rates vary a great deal from state to state is sometimes a measure of how badly managed their utilities have been (number of power plants built but not needed etc). Click here for a list of 150 or so canceled, abandoned or on hold non-nuclear thermal power plants. Proponents of any given energy scheme, be it wind, solar, or coal will high-five each other when a planned nuclear plant gets canned. Granted, powered fan towers are more efficient in the hot, dry side of Washington state, and parabolic updraft towers work best in the cool rainy side of the mountains. 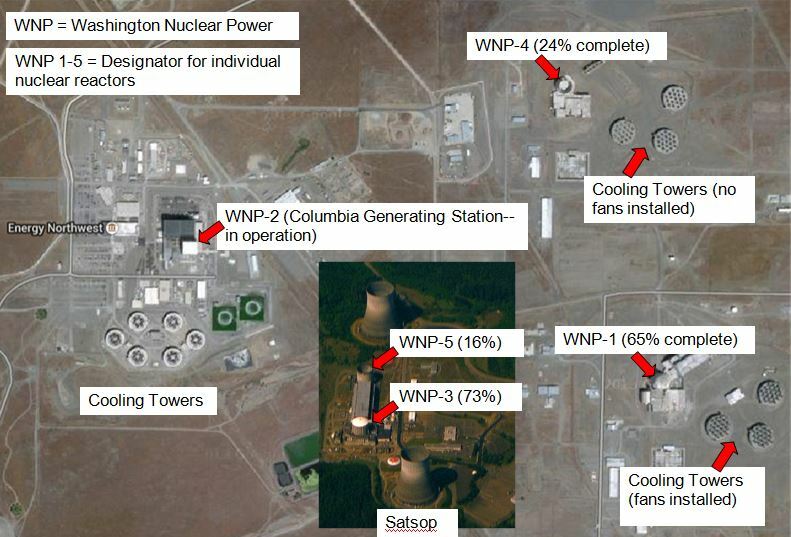 Looking at WNP-1 and WNP-4, it's obvious that they were striving to create twin facilities, but look how different they are from WNP-2, -3 and -5. Over the years, I have worked with a number of engineers who gravitated from the nuclear to the aerospace industry after the WPPS debacle and have heard their horror stories about the mismanagement first hand.